Spirit Dome returns with a perfect companion, Live Archive. Two out-of-print releases from this acclaimed ambient duo are brought together in this value-priced 2-CD release. Living proof of the power of live performance, these recordings are so immediate and engaging it would be easy to assume they were crafted over months in the studio. Live Archive, from their 1997 tour, serves as a natural complement to 2004’s Spirit Dome, recorded live to stereo master in one take in a studio-like environment. 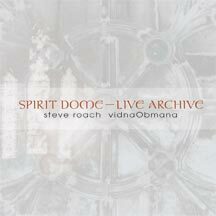 Steve Roach / vidnaObmana’s 2002 CD InnerZone served as the doorway to the surreal environment explored on Spirit Dome. Recorded in one continuous 74 minute session in a hotel room in Philadelphia, this is a dark sanctuary of pure texture and beautiful, if foreboding, dissonance pulled along with pulsing beats, subtle loops and dense soundworlds.The track captures a chilling gothic ambience that offers the exploration of remote psychological states of awareness. This is achieved by way of extensive live processing of instruments including fujara (overtone flute), guitar, and the seemingly bottomless wellspring of electro-acoustic sounds found only in the soundscapes of the duo. Live Archive, on the other hand, collects peak performance moments of pure energy and emotion from the duo’s live adventures. The wide range of venues, traveling to various countries, and above all their first tour together fueled their mutual intentions, challenging the artists to create music that does not know the limits of jet lag, equipment failures, and physical demands which occur when leaving the sanctuary of the studio.